The AC-2 is a DI (direct box) that encompasses all you need to deliver natural guitar tone on stage or in the studio. The AC-2 automatically restores tone lost through acoustic pickups, so your sound is always lush, resonant, and faithful to the instrument you have in hand. With 16 source guitar presets, the AC-2 recovers the sonic characteristics of a variety of guitar types and body shapes. You can choose from dreadnought, upright bass, nylon strings, 12 string, and more. Simply select your guitar of choice, then choose piezo or magnetic pickup. 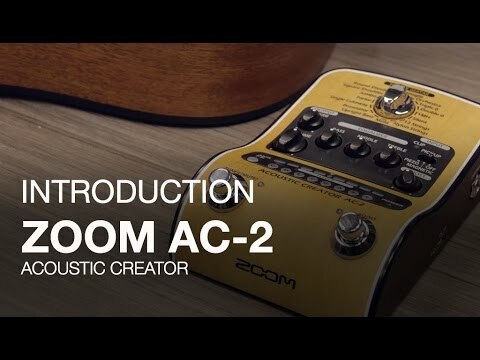 From there, the AC-2 is ready to reproduce and amplify your guitar’s tone with complete accuracy. The AC-2 features a high-quality preamp which boosts your signal and helps restore your true acoustic sound. Add its natural-sounding reverb to increase your acoustic’s depth and width, and round out your desired tone with easy 3-band EQ adjustments. The AC-2's Volume knob automatically controls the preamp’s input gain and output level, taking theguesswork out of adjusting sound levels to match. It’s allyou need to make volume controland setup simple when you’re playing live on stage. The AC-2’s balanced XLR output (with ground/lift and pre/post control) allows you to easily connect to any PA mixing board or studio console. It also includes two ¼” outputs for mono or stereo connection to amps, headphones, or audio interfaces. Since the AC-2 is designed to enhance your acoustic performances in all environments, it offers a variety of power options. Two AA batteries provide up to three hours of continuous power. Alternatively, you can use the Zoom AD-16 AC adapter for power, or the micro USB port to bus power the AC-2 via your computer.